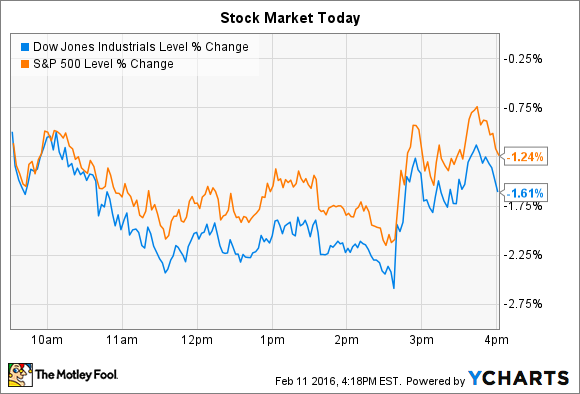 Fourth-quarter earnings reports sent these stocks higher while broader indexes fell sharply. Stocks recovered from their lows with a late-session rally, but indexes still ended the day in solidly negative territory. The Dow Jones Industrial Average (DJINDICES:^DJI) lost 241 points, or 1.6%, to slip back into double-digit losses for the year. The S&P 500 (SNPINDEX:^GSPC) shed 23 points, or 1.2%, and is also down 10% so far in 2016. But a few stocks had much better days. Tesla (NASDAQ:TSLA) and TripAdvisor (NASDAQ:TRIP) both made significant moves higher in the wake of their fourth-quarter earnings reports. Tesla gained 5% today after the electric car maker announcing widening losses last night; it bled $0.87 per share of red ink in Q4 compared to consensus estimates of $0.12 per share of profit. But CEO Elon Musk and his management team revealed a few positive operating trends, particularly regarding demand, that point to strong growth ahead even as gas prices plummet. On production, fourth-quarter deliveries rose by 50% against the prior quarter and by 76% compared to the year ago period. In fact, the Model S finished 2015 as "the only vehicle in its class with growing sales," Musk said in a shareholder letter. Its deliveries spiked higher by 50% as its closest competitor, the Mercedes-Benz S-Class, slipped 13% down to 22,000 sales. Yet management believes it has much more growth available "in all of our markets because of our limited retail presence," Musk said . To that end, the company forecasts deliveries of between 80,000 and 90,000 Model S and X vehicles combined this year, up from 51,000 in 2015. Tesla will lose money for the first three quarters of the year, management said, before steadily rising gross margins power positive cash flow and earnings beginning late in the year. That should put the company in a strong position to begin ramping up for sales of the Model 3, which it says is on track to be unveiled on March 31 for planned deliveries beginning late next year. Investors liked what they saw in travel site TripAdvisor's fourth-quarter report, sending shares 12% higher on the day. The sales and profit growth figures both trounced Wall Street estimates as the company made progress in its goal to create the best travel user experience -- from research, to pricing, to booking, to reviewing -- available. Revenue rose 7% to $309 million on strength in display advertising and from early contributions from TripAdvisor's new instant booking functionality. Non-GAAP net income jumped 27% to $66 million. Management is especially encouraged by the robust engagement it is seeing from its 350 million active monthly users. "User reviews and opinions reached 320 million and our content continues to attract the world's largest global travel audience," CEO Steve Kaufer said in a press release . The company plans to press those scale advantages by launching the instant booking function worldwide this year after introducing it to the U.S., U.K., and Canadian markets over the last few months. That roll-out should put pressure on sales and profit growth, as will ramped up investments in improving the mobile product, Kaufer warned. But these growing costs are worth the short-term pain since they "position our business for significant long-term growth," he said.